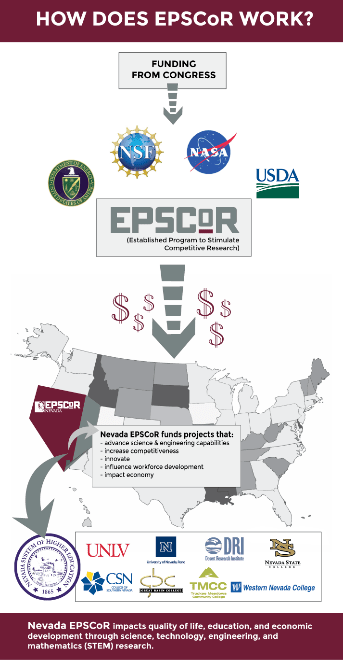 Established Program to Stimulate Competitive Research, (EPSCoR) was created to fund national areas that have historically receive less financial support through research and development (R&D) funding. The goal of EPSCoR is to create strategic partnerships between federal and state agencies, higher education institutions, and private industries to create long-term improvements in scientific research, infrastructures, R&D capacity and national competitiveness. EPSCoR programs have provided funding for faculty to acquire state-of-the-art research equipment, upgrade and improve research facilities, and attract high-quality graduate and undergraduate students into science, technology, engineering and mathematics (STEM) research areas. In addition, programs have enhanced graduate education, stimulated undergraduate student research, promoted the involvement of women and underrepresented groups in STEM and improved the pipeline for science and engineering through support of innovative K-12 science and math programs. The mission of EPSCoR is to assist the National Science Foundation in its statutory function “to strengthen research and education in science and engineering throughout the United States and to avoid undue concentration of such research and education.” EPSCoR goals are to 1) provide strategic programs and opportunities for EPSCoR participants that stimulate sustainable improvements in their R&D capacity and competitiveness and 2) to advance science and engineering capabilities in EPSCoR jurisdictions for discovery, innovation and overall knowledge-based prosperity. 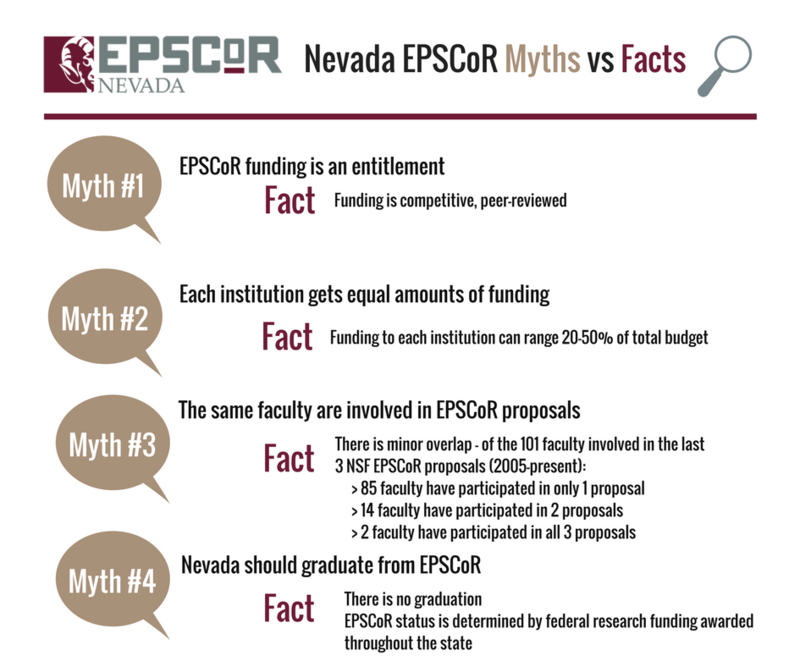 Nevada became an EPSCoR state in 1985 and since then has received seven NSF EPSCoR Track-1 awards, two Track-2 awards, and 1 Track-3 awards, totaling $72M*. These awards have been leveraged to receive approximately $ 121M in follow on funding. The NASA EPSCoR program strengthens the research capabilities of jurisdictions that have not had a competitive advantage to participate in aerospace and aerospace-related research activities. EPSCoR provides eligible jurisdictions with funding opportunities to develop a more active research base by involving their academic and research institutions. Nevada began working with a NASA EPSCoR planning grant in 1999. Through this grant, Nevada has the opportunity to establish research and development competitiveness and strengthen its economy through the expansion of aerospace technology. Nevada’s NASA EPSCoR program began in 1999 and since then has received nine NASA EPSCoR CAN awards, and three RID awards, totaling $10.5M*. These awards have been leveraged to receive approximately $49M in follow on funding.